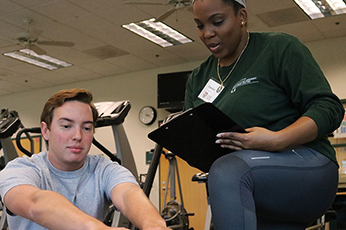 CHAMP (Canes Health Assessment and Motivation Program) is the Department of Wellness and Recreation’s comprehensive fitness assessment, education and incentive program that is free for students. The free CHAMP assessment consists of a simple battery of tests that evaluates your current fitness level and compares your results to national data. Regular fitness assessments allow you to track your progress and fine-tune your exercise program for guaranteed results. After each assessment, a CHAMP peer counselor will review your results, help set reasonable goals and devise a 12-week program to achieve those goals. All participants that attend follow-up appointments and complete their program receive fitness-related rewards. Cardiovascular fitness is how well your cardiovascular system is able to supply oxygen and blood to the working tissues of the body. The greater your cardiovascular fitness is, the greater your ability to perform moderate to vigorous activities for longer periods of time. Body composition is the ratio of fat mass to overall body mass and is typically explained as “body-fat %.” Lean tissue is comprised of muscle, bone, organs, skin and anything other than fat. Excess body fat is associated with increased risk of various chronic diseases such as heart disease, cardiovascular disease, diabetes and cancer. Muscular fitness is used to describe the combination of muscular strength and muscular endurance. Muscular fitness is important because it improves or maintains fat-free mass, musculotendinous integrity (which decreases risk of injury) and ability to perform activities of daily living. Flexibility is the “pain-free” range of motion that you can achieve around a joint through a particular movement. Adequate flexibility is essential to perform activities of daily living. Poor flexibility in the hamstrings and lower back is often associated with low-back pain and possible injury. To make an appointment with a CHAMP consultant, complete the CHAMP interest form below. Prior to your initial visit, you must complete a Fitness Laboratory Registration and read the Pre-test Preparation Instructions. The CHAMP program is free to all University of Miami students courtesy of an endowment provided by Patti and Allan Herbert.